Stories of our families are like blossoms. Some are beautiful stories full of life. Others are not so beautiful, like spent blossoms. Some are just buds as we try to find more information about them. Other stories may be like the loose stones under the tree-not related to the family at all. More information that Helen Butler supplied in July 2010 in an email to some Laws relatives. I'm publishing it here so all can see it. What we would do without all the work Helen has done over the years? There was enormous interest by the public in every ship arriving in Brisbane. So the Captain would always deliver to the Brisbane Courier a summary of his voyage. This was published in the paper as soon as possible. Saloon passengers are named, but Steerage passengers are not. The Bayswater anchored out in Moreton Bay at noon on Monday, 27 April. The government steamer Kate brought out officials to check the ship and the health of the people aboard. That evening, the Kate returned to Brisbane taking Captain Davies too, with his official papers for the government, his summary of the Log of the voyage for the paper, and the long-awaited mail from England. His story was printed in the Brisbane Courier on Thursday, 30 April, and also in the weekly Queenslander on Saturday, 2 May https://trove.nla.gov.au/newspaper/article/20318429. So the people of Brisbane knew all about the voyage, the passengers, and even every item of cargo and where each would be available for purchase. This list of cargo was also provided by the Captain and published in the paper. 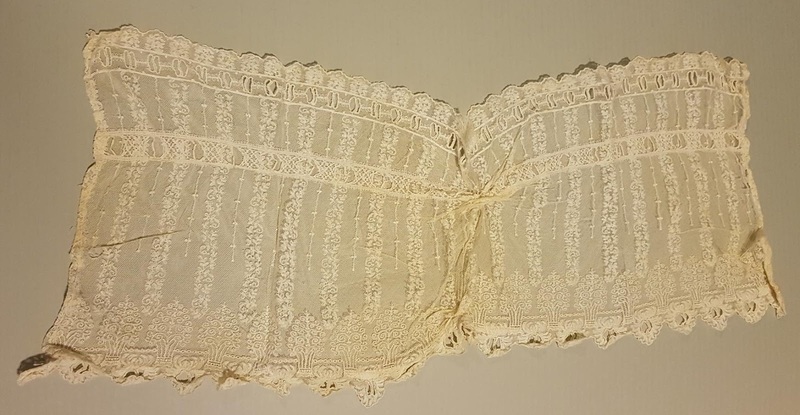 It has not been included now, but it is easily available on line at the National Library of Australia site-https://trove.nla.gov.au/newspaper/article/1314829. This site is well named, as digging in it brings up endless treasures. However ,the Bayswater did not sail up the river to dock until 14 May, another two weeks -two weeks of expectant waiting for the citizens of Brisbane, and more unbearably for the new arrivals still out on the water in sight of their new land. On 14 May 1868, William Laws and family landed in Brisbane from the "Bayswater". William had paid for the passages out. 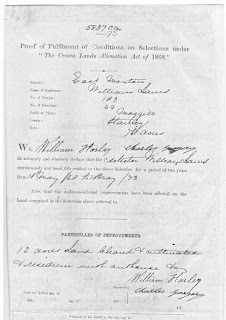 So under the Land Act of 1868 he was entitled to select land for a farm, free of charge but with conditions attached. On 18 May 1863, William Laws obtained 76 acres at Brookfield. 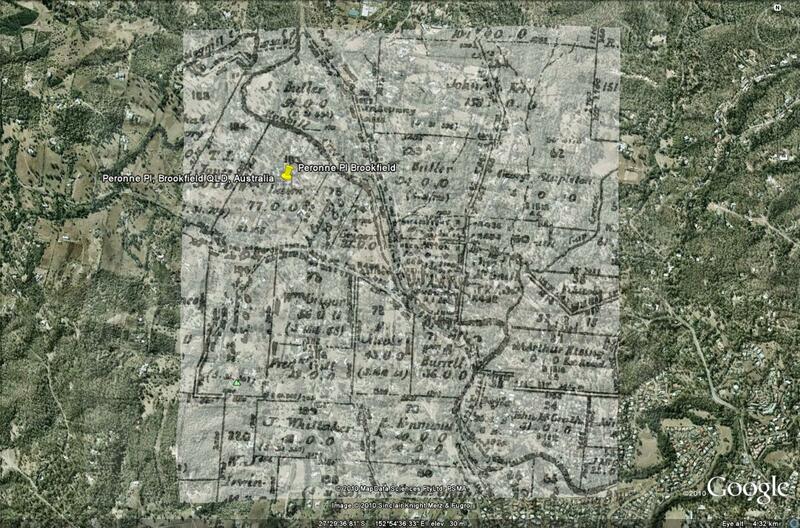 This was Portion 183 Parish of Stanley,County of Mogill, District of East Moreton. It was named also Selection (or Homestead) Number 49. It was classified as Agricultural land. 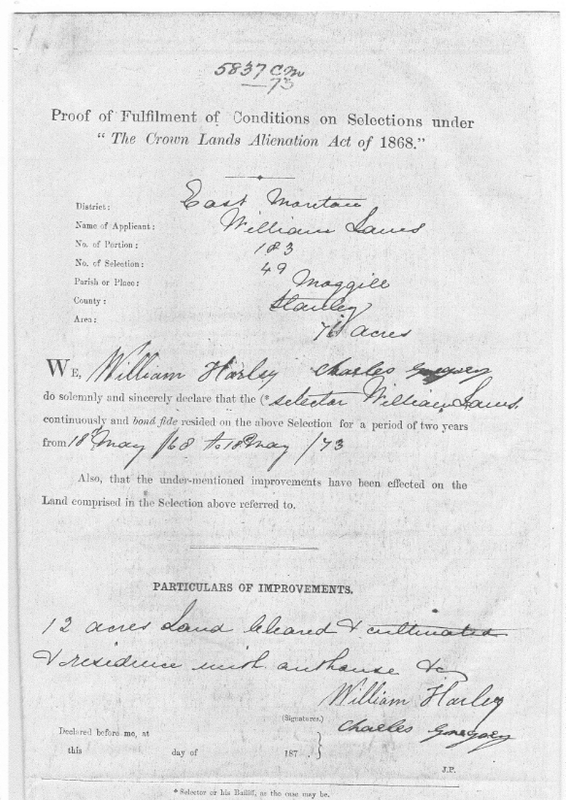 On 1 May 1868, Land Order No.3584 had been issued to William Laws to the value of 30 Pounds. From this was deducted each year his annual rent of 9 pence per acre,amounting to 2 Pounds 17 Shillings a year, for 5 years. But he did have to pay himself at the start , a Survey Fee of 3 Pounds 16 Shillings,and then at the end a Deed Fee of 1 Pound 5 Shillings. By 1 May 1873, the conditions of residence and improvement were fulfilled. On that exact date, William obtained a statement that this was true from a neighbour, Charles Gregory, and another. The improvements were stated as 12 acres cleared and cultivated, and residence and outhouse built. So now William owned 76 acres of Freehold Land, no more conditions about it . He could go and live somewhere else. He could rent the farm out. He could even sell the land. 1. CHARLES GREGORY , who witnessed in 1873 that William Laws had fulfilled the conditions to get the freehold on section 183, was stated by me to be his neighbour. But there is no evidence that this is so, just that it is very likely. Charles Gregory is the holder of section 185 on the map. Charles W Gregory is listed in the Post Office directories as farmer at Brookfield up to1912. The two families grew up together for some years at Brookfield, before Lawses moved away. But they remained in touch it seems. In 1895, Percy Laws son of William section 183 was best man at the wedding of Ellen Gregory, eldest daughter of Charles Gregory , The Grange Brookfield. Then in 1907 the widower Charles William Gregory married the widow Lillian Langham nee Laws, daughter of William Laws. 2. LAWS BROOKFIELD FARM .,SECTION 183 on the old land map, has been cleverly and neatly superimposed on the same scale onto the current Google Earth of the area by Judy Lofthouse. This shows Peronne Place in the middle of the Laws block. This would be the logical place for a road or street if you were dividing up a block. What a delight to find in amongst my Mother's treasures was her mother's diary. It was one of those little diaries with 6 lines to the day and 6 days to the opening. What was more interesting was that it was the time of her honeymoon. Who would have thought that in 1919 they would have a 5 week honeymoon leaving Allora Queensland by train for Sydney and Tasmania. 23/10/1919 Arrived Sydney. Went to Dixon's. got room "Beulah" Paddington St Paddington. First impression of Sydney dirty. 24/10/1919 Ryde by tram home by ferry up Parramatta River. walk through Gardens and Domain, saw submarines, art gallery. Scenery up river delightful. Lovely day. 25/10/1919 Shopping(coat) Watson's Bay. Yachting season opened beautiful sight. Picture show "Road through the dark" Mrs Rae's at night. 26/10/1919 Manly/lovely back by tram to the Spit Milsons Pt. North Sydney. Mrs D's for tea. 28/10/1919 Museum, pictures, Gardens & Theatre at night. Nothing special about theatre. 29/10/1919 Bondi, Botany Bay & La Perouse. Pictures "Civilisation" Manly after tea. 1/11/1919 Shopping(skirt) Dulwich Hill, Petersham cricket. McKerihans for tea. 2/11/1919 Manly with Mr McKerihan lovely day. Wynyard Park. 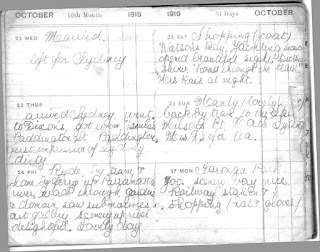 3/11/1919 Rest-Shopping(blouse& veil) Coogee very nice but very cold. Theatre in evening "Going up" nice. 5/11/1919 Business re Tasmania. dinner arcade, Sydenham in afternoon & for tea. 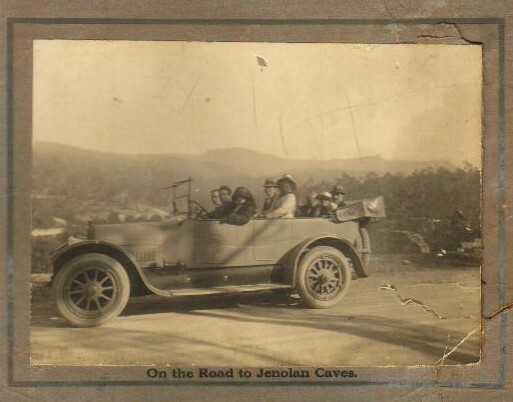 6/11/1919 Arrived Katoomba afternoon/rain in Sydney) Leura Falls/beautiful scenery-Bridegrooms cave. Off to Jenolan Caves. Lionel and Bessie in the middle row. 8/11/1919 50 mile drive to Caves through Grand Arch. Viewed Right Imperial & Lucas Caves. Devils Coach House, Carlotta Arch Very beautiful photo. Punctures on way home. Bush fire. 9/11/1919 Wentworth Falls & Valley of Waters in morning. Mt Yorke, Lovett's Leap & Hydra Majestic in the afternoon. 40 mile drive, big climb but lovely scene. 10/11/1919 Left Katoomba arrived Sydney disappointment all Tasmania room at Tempe. Now the diary has suffered the ravages of time( and children) and there is a week missing. 18/11/1919 Up Derwent River to New Norfolk walk in avenue & garden & town/beautiful. Turn-table spin/strawberries hops. 21/11/1919 Convict ruins before breakfast. Brake drive to boat. walk after tea up town shopping. souvenirs. 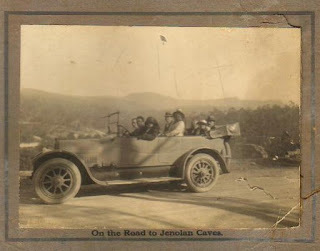 22/11/1919 Mount Nelson telescope Brake drive through Domain, Derwent Park & Springvale. Boat at night. One of the trips in a brake. 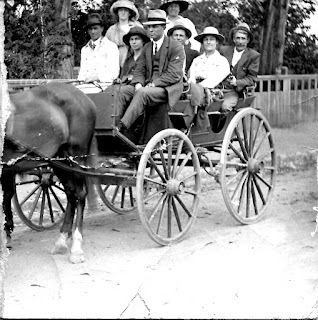 Bessie is standing at the end of the middle row with Lionel seated in the middle beside her. Pity about the horse losing its head. 23/11/1919 By train(3 hours) to National Park & Russell Falls beautiful Victoria Place after tea. 26/11/1919 Transport By tram to Cascades & walk to C. huts. Picnic in bush, lovely day. 27/11/1919 Met Arthur Hay. Brake drive to Collin's Vale beautiful scenery. Nice tea. 28/11/1919 Sewed. Lye sick. Wrote letters. 29/11/1919 Walked about town & Franklin Square. Left Hobart in "Manuka"
2/12/1919 Arrived Sydney 9am. Penshurst, Brighton Le Sands in the afternoon. Paddle, Music at night. 3/12/1919 Washing. Organ recital cards at night. 5/12/1919 Left Sydney from Penshurst. 6/12/1919 Nice journey. M Deegan at Stanthorpe. Home. 7/12/1919 Church at 8am "Glenvale" in afternoon & for tea. lovely day. 13/12/1919 Drove to Warwick. Took house. 15/12/1919 Left for Brisbane. Arrived Adelaide House. 21/12/1919 Church 8am visited Nellie. Motored out to "Glenvale"
23/12/1919 Quiet day at Allora. up street at night. 24/12/1919 Another quiet day, Xmas eve. Up town at night. 26/12/1919 Drove to Warwick. Unpacked furniture. 31/12/1919 Walked all around "Goondi" around river & over bridge. Storm in evening. Her diary had only small spaces for her to write in but we get the message that they were out exploring and meeting family and friends. What a lovely start to their new life together. My Mother said her father believed every newly married couple should have a honeymoon so her wedding present to us was a lovely honeymoon to Heron Island. 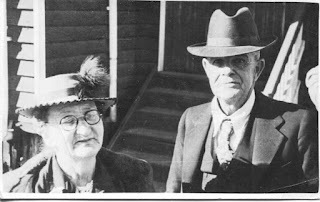 My grand father Lionel Laws married Bessie Holmes in October 1919. Unfortunatley we do not have any photographs from the wedding but Trove as usual comes to the rescue with a writeup about the wedding. This seems like an ordinary wedding write up but what made it special for me was the "veil arranged in a mob cap fashion" I had been given this "thing of tulle" that I couldn't work out what it was. However, after reading this description it was the mob cap style veil I think. 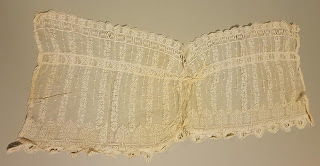 Notice the holes for threading ribbon along each long edge and the gathering in the middle that suggest to me it was the cap. What do you think? The other interesting item in the write up was that they motored to Hendon to catch the mail train en route for Sydney and Tasmania. 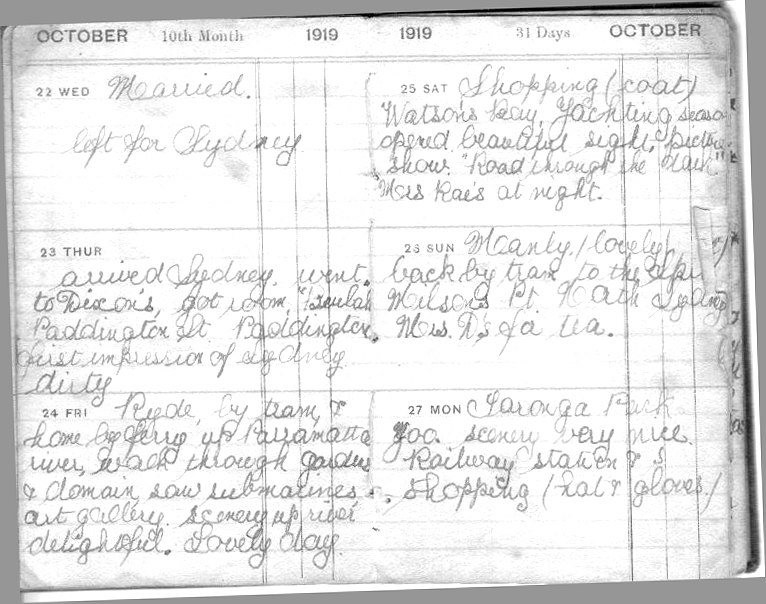 Bessie kept a diary for the honeymoon and that makes interesting reading but more of that another day. Another treasure that came to light was Lionel's hand written version of his speech at the wedding. It is with a deep sense of pride that I rise to thank you all on behalf of my future wife and myself for the many kind things you have said about us and also for the many & useful presents. I can assure Ladies and Gentlemen that they will always be remembered among our treasures and they will remind us of this very pleasant evening & of you all as our many friends. Bess & I are very thankful of the honour you have done us. I am sure Ladies & Gentlemen we will never forget you. Should any of you at any time be within reach of our home we will only ( be) too pleased to welcome you & may be able to help us use some of your gifts. For your kind wishes we also thank you from the bottom of our hearts & I hope you will not gauge the depth of our thoughtfulness by the scarcity of my words. I can no more than that. I again thank you very sincerely. Although we have no photo from the wedding between the veil and the speech we have treasures of their special day for us to cherish . FLASHBACK ••••••••• The youngest child of William and Sarah Laws was Frank Charles. He was born 28th April 1876, most likely while the family was still at Brookfield, He would have grown up at Kangaroo Point and probably went to the Normal School. He served his time in grocery and hardware (as apprentice ) and for a large part of his working life he worked at Barry & Roberts in Brisbane. He lived all his life in the Brisbane area. He married Margaret Robb, known to all the family as Aunty Maggie. She was very proud of her Scots ancestry. She was a lively talkative, and cheerful character, while Uncle Frank was quieter and more serious in manner. They were a very devoted couple all their lives, but they had no children. Aunty Maggie’s brother lived with them for some years. In 1914 -15 they lived in Edith St, Wynnum. Their nephew Frank Goodall Laws visited them there when as a boy he had a holiday in Brisbane with the Langhams. 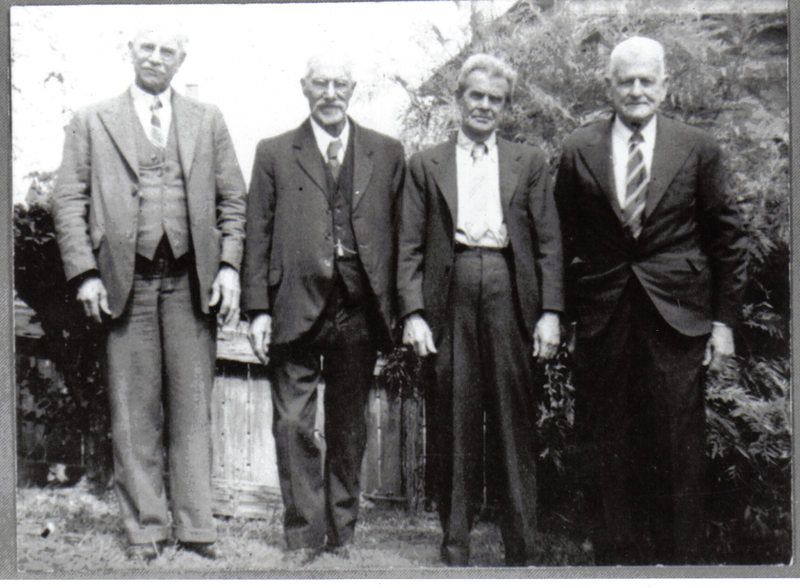 They probably lived at Wynnum until about 1921, when they were at 39 Mornington St, Red Hill. Here they lived all the rest of their lives. Olive Wood remembers when her family used to visit them there, going Saturday evenings to play cards. She also remembers their pet dog, which they both loved. In the Depression about 1930, Frank was put off at Barry & Roberts when staff had to be reduced. He was then about 54 years old and would have been working there close on 40 years. However, length of service was not considered. Men with no children dependants were the ones put off first. He was, however, presented with an engraved gold watch, and this he wore proudly for the rest of his life. There was no superannuation, and relief payment was only one pound per week, so being "put off" was a real hardship. Frank never again managed to get a job. 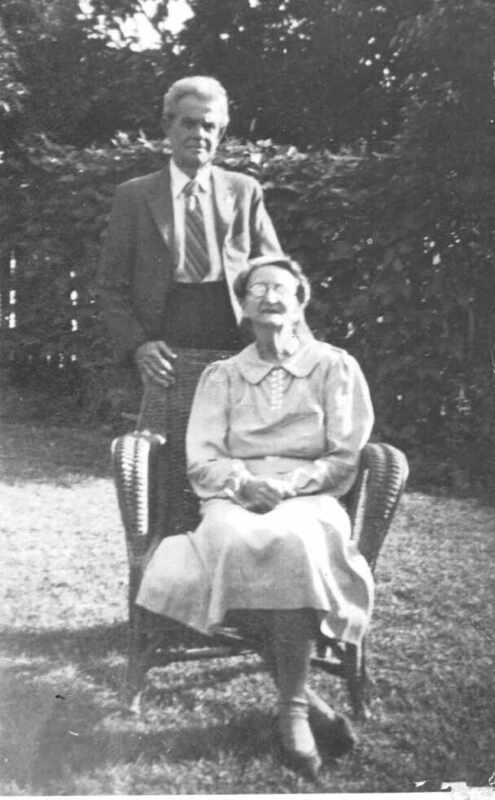 In the 1940's, his nephew Frank moved to live in Brisbane, and he and his family often used to visit Uncle Frank and Aunty Maggie during the week-ends. Uncle Frank used to smoke a pipe a great deal of the time and had his little vegetable garden, even though the site was very steep and difficult. Aunty Maggie did excellent fancy work and crochet. She was ‘not a well woman' for many years, as she had an irregular heart. The children used to enjoy the visit, for these two were real characters, most kindly and entertaining too. There were always lots of cookies and they would all play bobs and other games. Then there was the mysterious close room of treasures, which Aunty called "Bluebeard’s Room". Frank Laws died in 1955, and Maggie the following year. The remains of both these dear kindly people are at Mt Thompson Cemetery. This is reproduced with kind permission of Ann Doughty and Helen Butler from a family newsletter in August 1987. Ernest Albert Laws was born in England and was four years old when the family emigrated. He went to the Brookfield School, where his teacher for two years was Mr. George Francis. The Francis family had emigrated in 1872 on "The Light Brigade". A baby had been born on the voyage out. She was Annie Brigadia Francis, her second name being derived from the ship's name as the captain insisted that this custom be followed. When Mr. Francis was transferred from Brookfield in 1874, Annie was only two years old and Ernie Laws was ten. It is said that the two families knew each other well then, and that Ernie had often nursed Annie as a baby. 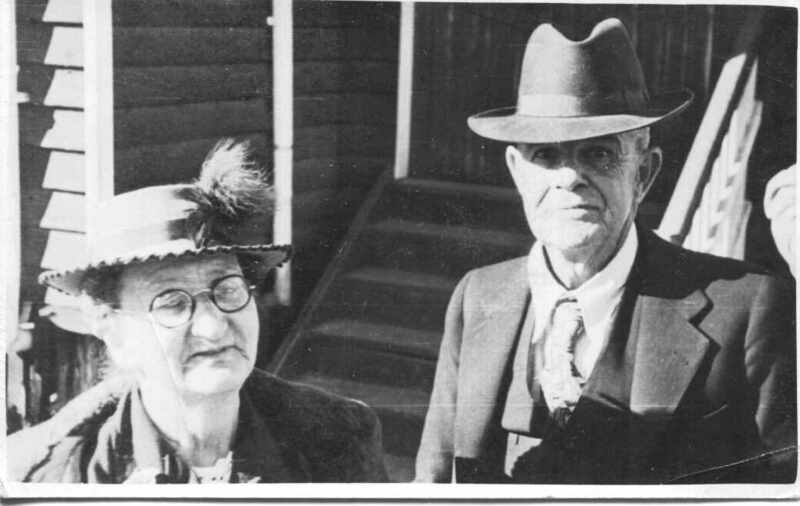 Twenty years later, on 24th March 1894, these two were married at Capalaba. E.A.Laws worked at first with a firm of auctioneers and commission agents named Dickson's, who were then the leading auctioneers in Brisbane. Ernie became a competent public auctioneer, and later started a business of his own. It seems from the Post Office Directories that for many years from 1901 Ernie's Auctioneer's Office shared premises at 192 Queen St with his brother Percy's Signwriting business. The Ernie Laws ' lived at Graham St South Brisbane until 1901, when they moved and lived for some years at Prospect Terrace, Highgate Hill. Later they moved to Water St, Carlton St and Fraser Terrace, all at Highgate Hill. In his later working years, Ernie Laws was accountant with F. W. Nissen & Co. Jewellers, in Brisbane. He remained here until he retired. Ernie Laws is said to have been a dapper city chap, with his gold watch chain and his walking stick, and often his bowler hat. 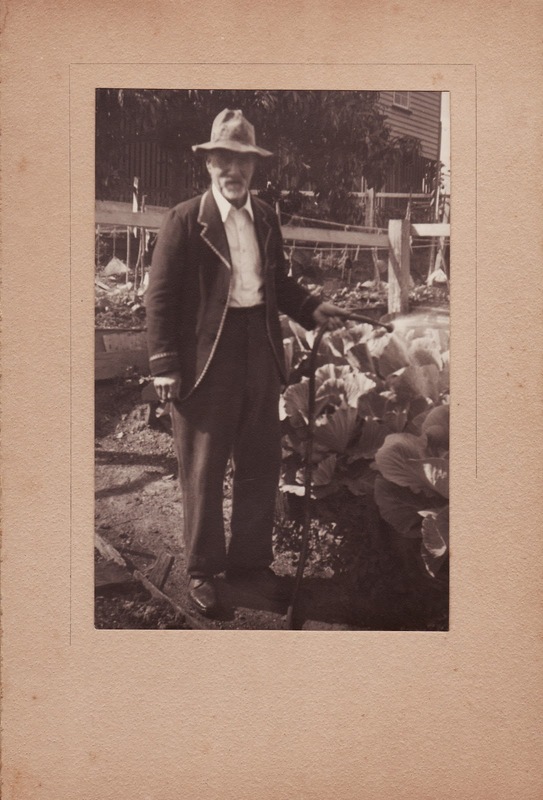 At the same time, he was a very keen gardener, and was photographed watering his vegetable garden. He died at 84 years in 1947. His wife Annie Brigadia died 20 years later, when she was 95 years old. She was a member of St Andrews Church of England South Brisbane , 75 years . and having an assistant travelling with her. She married Wal Foster, a watchmaker in 1928. They had no family. After her father's death, her mother lived with Vivie and Wal at their home in Pelham St, Coorparoo . Vivie died in 1976, four years after Wal Foster. Eric Laws attended the Normal School and then the Brisbane Grammar School at the same time as Harry Roberts, who was a cousin of his Percy Laws cousins and later a renowned Headmaster. Eric had a distinguished career in the Public Service . In 1916 he joined the Taxation Office as clerk . In 1924 he transferred to Dept of Labour and served in Rockhampton, Bundaberg, Innisfail and Townsville , acting as Labour Agent and Industrial Inspector. He returned to Brisbane in 1940, and in 1941 he transferred to the Commonwealth Dept of Labour & National Service and established the National Employment Office in Brisbane. The following year he was appointed Asst Deputy Director-General of Manpower in Queensland, and held this important· position through the war years . After the war, he remained with the same Commonwealth Department, becoming Deputy Director of Employment for Queensland. In this position he established and organized the Commonwealth Employment Service. In 1952, Eric Laws became Queensland Regional Director of Department of Labour and National Service, a post he held until he retired in 1961. Eric Laws married May Owens and they lived happily until she died in her fifties. There were no children. Eric had a remarkable record of community involvement. He joined Rotary in Townsville. In the Cleveland Branch he served as President, and was so valuable a part of the club he became known as "Mr Rotary". As well, he served on the local Ambulance Committee, the Cancer Fund Society and the church council. With his wide experience of public affairs, he was of great assistance to these organizations. Besides this, he was always ready to help any individual who came to him. He was highly revered in the community. Unfortunately, only three weeks after the death of his mother, Eric Laws died suddenly, aged 66 years . Percy b 1873 Brisbane, Ernie b 1864 Hampshire England, Frank b 1875 Brisbane, Lionel b 1868 at sea. This photo was taken on 19th Dec. 1940 when some of the family gathered to farewell Jack Laws at Redbank Army Camp, just before he left for overseas service with 2nd 15t h Battalion. Jack’s brother Frank took the photo.